Posted December 27, 2017 by Cape Porpoise Lobster Co.
Are you hosting a New Year’s Eve party or attending one and need to make a dish? If you’re looking to bring something a little more creative than a fruit or vegetable platter, try out these lobster cocktail recipes! This Bobby Flay recipe offers a delicious, smooth taste with a kick! Whisk ½ cup fresh lime juice, 2 teaspoons of honey, 2 tablespoons of drained Worcestershire sauce, 1 teaspoon hot sauce, 1 tablespoon freshly chopped tarragon and salt and pepper to taste in a bowl. Then gently fold in 2 cups of coarsely chopped lobster, 1 peeled, pitted and diced avocado, and ¼ cup chopped watercress leaves. For a unique presentation, serve the cocktail in shot glasses! The Neelys’ Lobster Salad Cocktail combines comforting southern taste with a festive presentation! To make the mayonnaise sauce, combine 1/3 cup mayonnaise, 1 teaspoon lemon zest, the juice of one lemon, salt and pepper to taste, 1 stalk finely chopped celery, 1 finely chopped shallot, 1 tablespoon finely chopped tarragon and 1 tablespoon finely chopped chives in a bowl. Add 3 cooked and chopped lobster tails to the sauce and combine. Use martini glasses for a fun presentation style! Rub the rim of martini glasses with a lemon and then dip the rims in some dry rub. Divide the lobster salad between the glasses and garnish with lemon slices. These recipes won’t be complete without high quality Maine lobster, so call us at Cape Porpoise Lobster Co. today to place your order in time for New Year’s Eve! There’s nothing like delicious, fresh Maine lobster. In fact, you might even be craving it right now! But what sauces should you pair with this delectable seafood treat? From classic to experimental, lobster is the perfect protein for a variety of dishes. Read on for a few great ideas. Classic French lobster thermidor will impress any guest. If it’s a diet “cheat day” for you, try the richly indulgent original, which includes brandy, egg yolk, mustard and cheese. If you’re looking for an everyday indulgence without the calories, try a thermidor-infused butter with white wine, Dijon mustard, lemon, paprika and Parmesan cheese. An Asian-style sauce can also work as long as you don’t overwhelm the tender flavors of the lobster with too much chili or ginger. Try a simple sauce of rice wine vinegar, soy sauce, and a dash of ginger and sugar. Serving lobster at your next get-together? Dipping sauces make a great choice for lobster, whether you serve it room temperature, warm or chilled. Go for an herbed lemon sauce with olive oil, lemon, salt and fresh herbs, a spicy tomato-jalapeno with ketchup, jalapeno and balsamic vinegar, or a Thai-style sauce with soy sauce, sugar, fresh lime juice and sesame oil. Why not try all three? Hungry for lobster yet? Cape Porpoise Lobster Co. offers top-quality lobster and other seafood delights, which can be at your door in as little as 24 hours! We include free overnight shipping with every order. Call 1-800-967-4268 today, and get cooking! Three Lobster Pizza Recipes You Can’t Skip! Posted November 27, 2017 by Cape Porpoise Lobster Co. 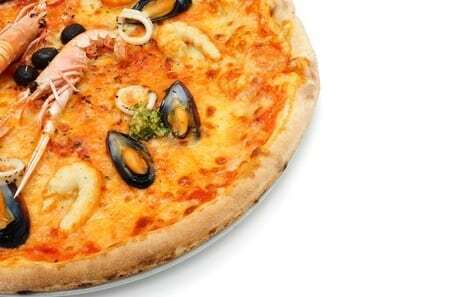 If you love lobster and casual dining, then lobster pizza is probably one of your favorite foods. If you’ve never tried it before, don’t worry! Cape Porpoise Lobster Co. picked out our three favorite lobster pizza recipes for you to try at home. Check them out below, and make them for your next game day party. Heat your oven to 425 degrees, and prepare the polenta by following the instructions on the box. Spread it into a thin layer on a non-stick baking sheet, and bake for 20 to 25 minutes until it’s slightly crispy. Add mascarpone, garlic, salt, and mash with a fork. In a large skillet over medium heat, add olive oil and butter. Add the lobster tails and cook until they are bright red. Chop them into smaller pieces once cooked. Spread the roasted garlic/mascarpone mixture on the polenta crust, add some fontina, and then the lobster and cherry tomatoes. Bake for 15 to 20 minutes until the cheese starts to bubble. Slice, and serve! Prepare the pizza dough, wither with a stand mixer or your hands and a wooden spoon. Preheat the oven to 375, and while the dough is rising, prep the toppings. Boil about 6 cups of salted water, and add in the lobster tails. Simmer for 8 to 12 minutes, until the shells are bright red. Drain, remove the tails, chop the meat, and set aside. Cook the bacon in a skillet, and set aside, saving about 1 tablespoon of bacon fat. Add the shallot and garlic to the skillet, cook for a minute, and then add the spinach. Remove all items, and then add the butter. Remove from heat, and add parsley, oregano and crushed pepper. Drizzle half over the lobster, and toss. Spread the remaining brown butter onto the pizza dough, sprinkle with sun-dried tomatoes, and the spinach mixture. Top with cheese, lobster meat and the bacon. Bake for 20-25 minutes or until cheese is perfectly melted! Yummly’s lobster alfredo pizza is a rich and delicious option, perfect for the cooler fall and winter days! Prep the dough. While it’s rising, add chopped garlic, shallot, butter and herbs to a medium pan over low heat. Mix in cream, and grated parmesan. Add the sherry. Arrange the lobster on the pizza dough, and pour the Alfredo sauce over the meat. Cover with mozzarella, and bake at 375 until golden brown. Slice and enjoy! 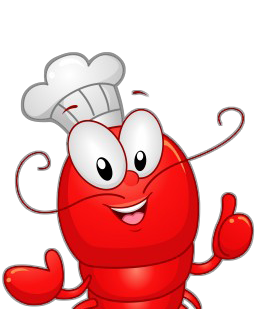 Cape Porpoise Lobster Co. has all of the lobster you’ll need for your pizza recipes. Shop now and call 1-900-967-4268 with any questions you may have! Posted November 22, 2017 by Cape Porpoise Lobster Co.
One great thing about the holiday season is the great food that comes along with it. 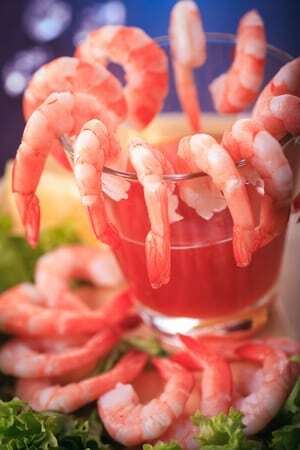 Many people prepare shrimp cocktail during the holiday season as a special appetizer for guests. This particular recipe for shrimp cocktail has an “adult sauce” that resembles the classic Bloody Mary beverage. Best of all, it is extremely simple to prepare and requires very few ingredients. Heat tomato juice, vodka and red pepper sauce over medium-high heat. When the mixture boils, stir in sugar and reduce heat. Simmer uncovered for 5 minutes. Stir in celery salt and parsley, then pour over shrimp. Cover and refrigerate 2 to 3 hours before serving. This holiday shrimp wreath is an elegant appetizer display for any holiday party! The base: a Styrofoam wreath base from a craft store. Wrapped in a layer of plastic wrap and topped with lettuce leaves, it is the perfect place to serve your shrimp. Create tray using above directions. Toss shrimp, lemon juice and seafood seasoning in a large bowl. Mix remaining ingredients and spoon into serving bowl. Place serving bowl at center of wreath and serve! If you are hosting a winter-themed party, this is a festive and fun way to serve shrimp cocktail. We recommend a holiday themed tray for an extra touch of holiday spirit. Fill tray half-way with cold water and ice. Slice fresh lemons and place on top of ice. Place shrimp over the lemons. Add a bowl of cocktail sauce to the center. These three shrimp cocktail recipes will please any crowd of people in any holiday party setting. An important part of creating any great shrimp dish is purchasing great shrimp to go along with it. 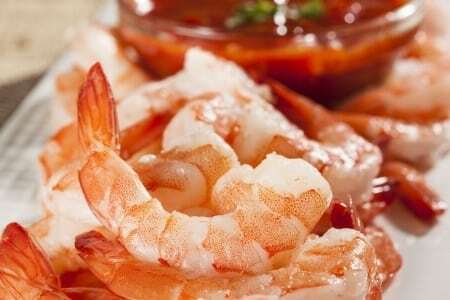 This holiday season, get your shrimp from Cape Porpoise Lobster Co! Seafood dinner is a holiday tradition spanning the ages. And, in our opinion, there is no better seafood than lobster! Lobster is great for more than just the main course. We also love to use lobster in our holiday appetizers. Served on a cracker, these bite-sized snacks are both healthy and flavorful. Perfect for munching on while you mingle with guests. Slice cucumber into 1/8 inch slices. Toss lobster meat with mayo and red pepper. Spoon lobster mixture onto each cucumber slice. Place cucumber slices on crackers and serve! 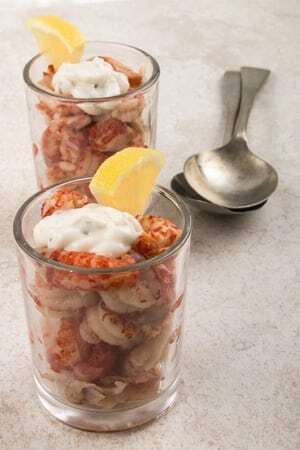 Another delicious (and easy to make) lobster appetizer, these lobster bites will be flying off the table faster than you can imagine. Slice baguette into 1/8 inch slices, place on cooking sheet and toast in oven. Toss lobster meat with mayo and celery. Spoon lobster mixture onto each toasted baguette slice and serve. Happy Holidays from Cape Porpoise Lobster Co.! We hope your holiday celebration is filled with friends, family and some delicious seafood. Need last minute supplies? We offer free overnight shipping with every seafood order. Shop with us online or by phone at 1-800-967-4268. 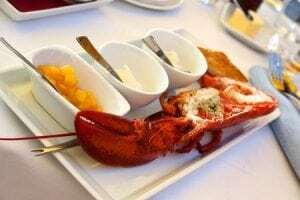 When you think of Thanksgiving food, you surely think of turkey, stuffing, mashed potatoes … but do you think of lobster? The Native American diet was heavy on shellfish, so lobster was most likely part of the first Thanksgiving dinner. 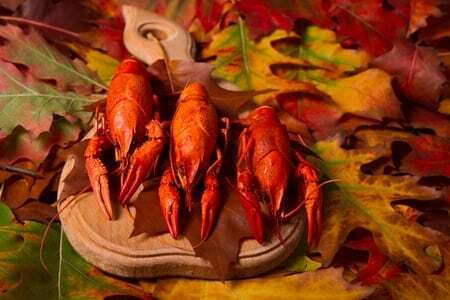 Keep the tradition alive by incorporating your favorite crustacean into your Thanksgiving dinner! Add the delicious taste of lobster to a classic holiday favorite with these easy-to-cook lobster mashed potatoes. Pick them clean and saute the lobster meat with butter until butter is orange. Add evaporated milk. Cook potatoes and mash, adding sour cream as you mix. Serve mashed potatoes, topping with lobster and peas. Looking for a different take on lobster pasta? Why not make this lobster, pumpkin and ricotta ravioli, and find out what a match made in heaven lobster and pumpkin can be? Cook lobster and pick out meat. Saute lobster meat with butter (about 4 minutes). Add flour and milk, stirring over low heat until you have a sauce-y liquid. Stir in ricotta cheese, mascarpone cheese and pumpkin. 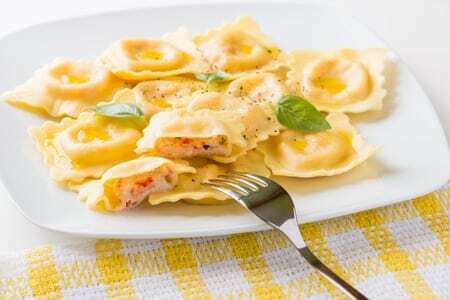 Cut egg noodle sheets into ravioli-size squares, adding lobster mixture to half. Rub edges of squares with butter and top with another square, using a fork to seal them together. Boil water and drop ravioli in, cooking for 5 minutes. Start off your meal with a delicious lobster and corn bisque, which you can serve with a wedge of freshly baked cornbread. Heat oil in a large pot. Add flour 1 Tbsp. at a time, stirring 5-10 minutes until blended. Add onions, corn, shallots, celery, garlic, salt and cayenne, stirring occasionally until the onions have softened. Add bay leaves and bring to boil. Add milk, cream, and crab boil, simmering for 30 minutes. Stir in lobster meat and green onions, simmering for 5 minutes. This recipe is sure to wow your guests with its sophistication. The best part? You can make the vinaigrette and puree the day before, so all you have to do on Thanksgiving Day is cook the lobster. Combine 1 cup chicken stock with apple cider, shallots, bay leaves and sherry vinegar in a large saucepan, boiling 25 minutes (until reduced by half). Add heavy cream and nutmeg, simmering about 5 minutes, then remove from heat. Heat vegetable oil in a separate saucepan, adding onion and cooking until softened. Add remaining chicken stock and chestnuts, simmering about 4 minutes. Remove from heat, then add maple syrup and butter. Transfer contents to blender and puree until smooth. Blend in sour cream, then transfer to saucepan, cover and keep warm. Reheat nutmeg vinaigrette, adding scallions, parsley, salt and pepper. Cut lobster tail meat into chunks, then add back into tail. Spoon vinaigrette over lobster tails and place on platter with puree. Wondering what wine to pair with your lobster dish? Champagne is a natural pairing for lobster, and will get your meal off to a festive start. Cheers! Ready to plan your Thanksgiving menu? Cape Porpoise Lobster Co. has high-quality lobster for all of your Thanksgiving recipes. We offer free overnight shipping with all orders of our lobster and other seafood products. Call 1-800-967-4268 to order your Thanksgiving lobster today! 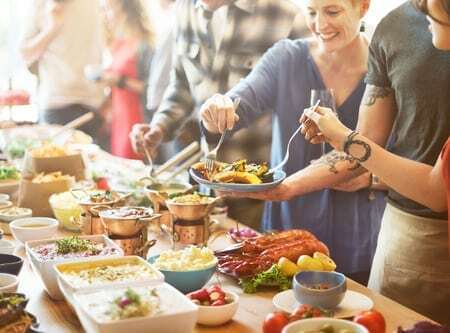 With Thanksgiving just a month away, most family cooks are starting to plan for this momentous feast, searching for new recipes and ideas to improve everyone’s favorite dishes. Whether you usually bring the stuffing, soup or squash, choosing a seafood recipe is a great way to add some spice to the dinner table! While seafood isn’t traditionally considered Thanksgiving food, the rich flavors will fit right in to your grand feast. Start a new tradition this holiday season and be prepared for your family to ask for your signature dish again. A savory first course, creamy seafood chowder is full of flavor, with shrimp, scallops, crabmeat and clams inside. Paired with crusty bread, this delicious dish is a great way to warm your guests up as they make their way in from the cold. 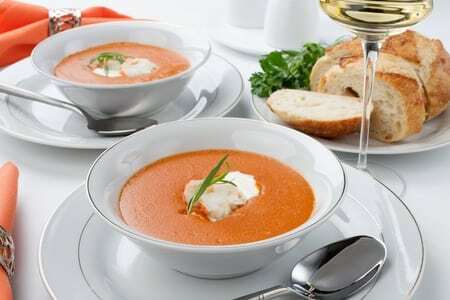 Combine 1/2 cup of milk, cream cheese and garlic in a large pot, stirring over low heat. Mix in soup, green onions, carrots, corn, potatoes, parsley and remaining milk. Season with black pepper and cayenne pepper. Simmer 25 minutes without boiling. Mix in shrimp, scallops, crab meat, calamari and clams. Cook 10 more minutes and serve. A tasty twist on a Thanksgiving classic, adding oysters to your stuffing will have all your guests reaching for a second helping. Mixed with bacon, celery and herbs this simple yet gourmet side dish is the perfect way to add a taste of the ocean to your plate. Spread bread evenly in an 18 x 12″ baking pan. Bake 30 minutes (until golden brown). Chop celery, shallots, garlic, thyme and parsley. Cut bacon into 1/4″ pieces. Chop oysters and refrigerate. Cook bacon in skillet until crisp, then transfer to bowl with bread. Add celery and shallots to skillet, cooking for 5 minutes (until tender), then transfer to bowl with bread. Add parsley, oysters, oyster liquid and black pepper to bowl with bread as well, then stir. Transfer stuffing to greased baking dish, cover with foil and bake 30 minutes. Uncover and bake 20 minutes longer or until top is golden brown. A unique and creamy vegetable, the artichoke pairs perfectly with crab meat. A tasty side dish that looks like a work of art, more than one of your loved ones will be asking for this recipe at the end of the evening. To prepare stuffing: Combine crab meat, breadcrumbs, shallots, celery, capers, Old Bay seasoning, pepper, lemon juice and oil in a bowl. Spoon 1/2 cup stuffing in the center of each artichoke, then stuff an additional 1/2 cup between the outer leaves with a small spoon. Heat 2 tsp. oil in a Dutch oven, then add garlic and cook until fragrant. Add broth and lemon juice, bringing to a simmer. Stand artichokes upright in the pan, drizzling each with oil. Cover pot and bake in over about 50 minutes. Uncover and bake about 10 minutes longer (until stuffing golden brown). Buttery and delicious, acorn squash will add a bright and festive flavor to your dinner table. A fall favorite, we recommend stuffing your squash with lobster for a gourmet treat. 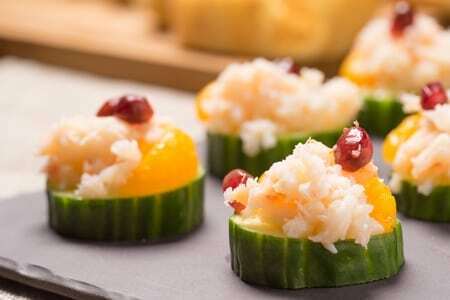 Halved, stuffed squash also make a beautiful presentation your guests will love. Cut acorn squash in half lengthwise and remove the seeds. Place squash cut-side up in a baking dish. Season with olive oil, salt and pepper, then roast for 45 minutes. Boil lobster (about 10 minutes). Remove lobster meat after lobster have cooled. Saute mushrooms and leaks in a pan with olive oil. Add bacon and lobster meat to the pan, seasoning with salt and pepper. Divide the mixture between the acorn halves, top with breadcrumbs and bake until warm. Make your Thanksgiving meal a success with seafood from Cape Porpoise Lobster Company. Caught off the coast of Maine, our fresh crustaceans and mollusks ship overnight. Place your order online or by phone at 1-800-967-4268. Have a great seafood recipe you plan to make this Thanksgiving? Share it with us in the comments section below! Posted November 3, 2017 by Cape Porpoise Lobster Co.
With the colder weather upon us, this is the perfect time of year for warm and hearty meals. If you love seafood, there are some incredible lobster recipes for the crock pot and slow cooker to try out! Lobster rolls are a New England summertime staple, but this recipe proves they are perfect for fall and winter too! This easy recipe is delicious and flavorful with rich buttery flavor. With a small ingredient list of 4 lobster tails, 4 hot dog buns, 1 ½ stick butter, 1 lemon, 1 clove of garlic and a quick 30 minute cook time, this low-maintenance recipe is perfect for spicing up family dinners. Lobster and risotto is a winning combination in the slow cooker, as the long cook time makes the risotto nice and creamy and the lobster meat perfectly tender. Corn, tomato, chicken stock and herbs add a nice savory flavor to the dish. Serve the risotto in small portions as an appetizer, or make it a one-dish meal by serving with salad and artisan bread. Try a traditional creamy chowder loaded with lobster, potatoes and savory spices for the perfect hearty soup dish on a cold day. 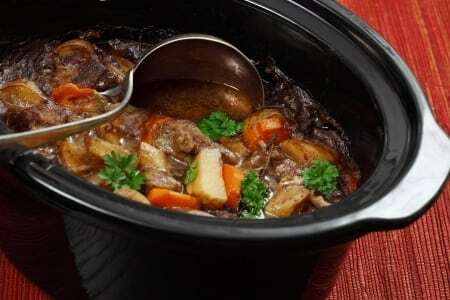 Load up your slow cooker with all the ingredients in the morning, let it cook throughout the day and enjoy a delicious dinner! Of course, these dishes need high-quality lobster to really satisfy. Here at Cape Porpoise Lobster Company we catch the best Maine lobster and deliver it right to your door. Shop our online store today to find just what you need to make the perfect lobster recipe! Posted September 26, 2017 by Cape Porpoise Lobster Co. Seafood isn’t just delicious – it’s also good for you! The next time you’re craving a lobster roll, shrimp cocktail or another seafood delight, rest assured that it’s a treat for your entire body – not just your taste buds. Seafood is a great way to get the protein your body needs to build muscle without the added fat that’s present in other protein sources like meat and cheese. In addition to being high in protein and low in fat, seafood is also high in omega-3 fatty acids. You may have heard of these before, but did you know about the amazing array of health benefits they provide? They maintain heart health by helping to regulate blood clotting and vessel constriction. They reduce tissue inflammation and help alleviate the symptoms of rheumatoid arthritis. They’re important for babies’ neurological development, both before and after birth and they may even reduce depression! Lobster contains high amounts of calcium and phosphorus, two important nutrients for bone health. These nutrients help children grow and assist seniors in keeping their bones strong as they age, but are essential for people of all ages. Just one six-ounce serving of lobster contains 40% of your daily phosphorus requirement and 14% of your calcium requirement! After reading some of these important benefits, we’re sure you’re craving seafood. Cape Porpoise Lobster Co. has you covered! We offer free overnight shipping with all orders of our delicious seafood products. Call 1-800-967-4268 today to place your order! Posted September 14, 2017 by Cape Porpoise Lobster Co.
Fall is here and that means football season is too! 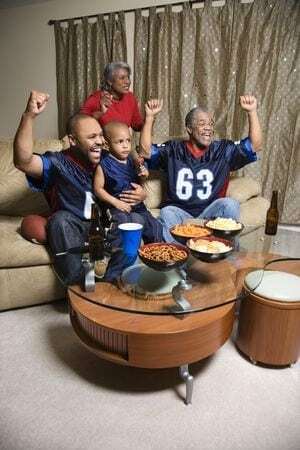 If you are one of the many families who gather in front of their television set on Sunday afternoons – cheering on their favorite team – you know how important it is to have some delicious appetizers prepared for easy eating between plays. While seafood may not be the first snack to come to mind, it can make a unique and tasty change from the usual chips and salsa. From salmon to shrimp there are plenty of options to choose from to keep your group energized and upbeat throughout the game. Add some flavor to your tray of crackers with this fun (and easy to make) recipe. With only six ingredients and no cooking involved, you can even make this spread at halftime! Chop salmon, dill weed and green onion, then set aside. Stir cream cheese in a medium size bowl until smooth. Add salmon, Worcestershire sauce, hot sauce, dill and onion. Mix Well. Stir and serve with crackers. A typical game day food, artichoke dip is one of our favorites. The best way to make it your own: Add some crab meat! Baked in a bread bowl, this gourmet meal will require almost no cleanup, which means you can catch the Sunday evening game as well. Preheat oven to 375 degrees F and line baking dish with aluminum foil. Mix all ingredients together, seasoning with salt and pepper to taste. Cut the top 1/3 off the loaf of bread, then remove bread filling. Place remaining bread bowl in your baking dish. Fill with mixture and bake for 30 minutes. Whether you are a fan of shrimp, lobster or scallops, you can make it game day fare with a little bacon. Here at Cape Porpoise Lobster Co. we sell bacon wrapped lobster tails, but you could also purchase shrimp or scallops and wrap your own. A crowd pleaser that your whole party will love, stick these treats in the oven as the game begins for a second quarter snack. Enjoy the big game with these delicious appetizers and celebrate your victory with a gourmet meal. From swordfish steaks to seafood burgers, there are plenty of tasty options to try! Pick out your fresh Maine seafood online or call us at 1-800-967-4268 to place your order. Next day shipping is always included.